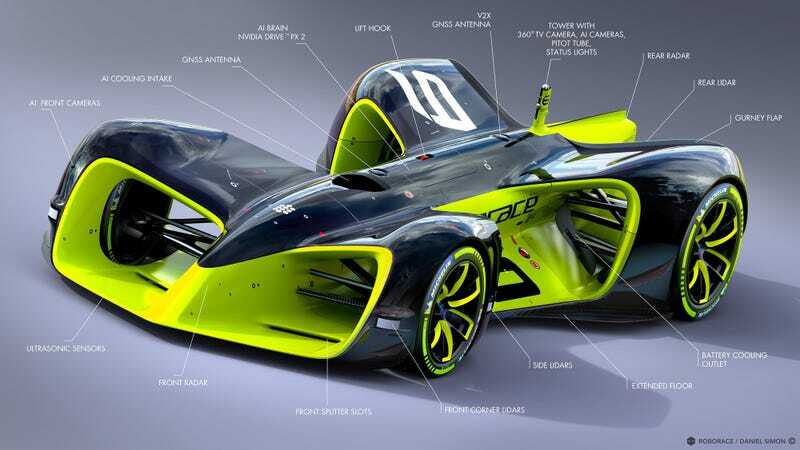 Roborace, the new autonomous racing series set to run alongside Formula E, has just released the final design for its unbelievably cool race car designed by the guy who created the Tron: Legacy Light Cycle, and it’s both a beautiful design achievement and an engineering breakthrough. To catch you up, the Roborace series is fully autonomous, meaning the cars don’t need to be engineered to haul around the squishy guts and brittle bones of us simple, fragile land walkers. Instead the car uses an immense suite of cameras, antennas and sensors to tear laps around the track. The new photo labels the insane amount of technology packed into the gloriously-shaped curves of the racecar, with the latest design adding a beefier top antenna, front splitter slots, a bigger/different battery cooling outlet, a gurney flap along the rear hips replacing the original design’s fins, as well as detailing the location of the font cameras, radar, lidars and the Nvidia Drive PX2 brain powering it all. Initial expectations see the car exceeding 180 miles per hour, utilizing as much downforce as possible with active aerodynamics. It helps that there isn’t a big meatsack weighing it down, poking its head out. At the same time, I really want to drive this for myself. But Formula 1 isn’t going anywhere and, for now, neither is Formula E. I can’t wait for the day when all three series have one big race in a classic humans versus machines battle to the dea... finish line.